European Council president Donald Tusk has said a "short extension" to Article 50 would be possible but only on the condition MPs backed Theresa May's Withdrawal Agreement. His comments come after the Prime Minister wrote to him on Wednesday requesting a Brexit delay to June 30. Speaking in Brussels, Mr Tusk said there was still a question of how long such an extension would be. "In the light of the consultations that I have conducted over the past days, I believe that a short extension would be possible," he said. Mrs May will address the nation on Wednesday night. Earlier, during a heated Prime Minister's Questions, Mrs May was accused of "running down the clock" as she told MPs of her request for a short extension to Brexit negotiations. Labour leader Jeremy Corbyn said he had still not seen legally-binding changes to the Brexit deal saying Mrs May had "run out of ideas" after the Prime Minister announced she would be bringing the same deal back to the Commons for the third time next week. Speaker John Bercow later granted Labour's application for an emergency Commons debate, known as an SO24, on allowing MPs to consider the length and purpose of the extension of the Article 50 process requested by the Government. Mrs May has invited all opposition party leaders for a meeting in her parliamentary office on Wednesday evening before she makes her statement. In the letter to Mr Tusk, the Prime Minister said the UK remains committed to leaving the European Union "in an orderly manner on the basis of the Withdrawal Agreement and Political Declaration agreed in November." The Prime Minister told MPs on Wednesday she intends to table the Withdrawal Agreement, which she has negotiated with the EU for a third time, in the hope of overturning the massive defeats inflicted on it in January and March. Referring to the current deal, she said: "I also intend to bring forward further domestic proposals that confirm my previous commitments to protect our internal market, given the concerns expressed about the backstop." Mr Bercow said this week he would not allow the same motion to be brought again during this session of Parliament, unless it was substantially changed. In the letter to Mr Tusk, Mrs May said she was "confident that Parliament will proceed to ratify the deal constructively," but added this would "clearly not be completed before 29 March 2019." During Prime Minister's Questions, Mrs May told the Commons: "The Government intends to bring forward proposals for a third meaningful vote. In response, Mr Corbyn said: "Today marks 1,000 days since the referendum and this Government has led the country and themselves into crisis, chaos and division. "They've run out of time, they've run out of ideas." European Commission president Jean-Claude Juncker warned the Prime Minister in a phone call shortly before her announcement that Brexit would have to be complete before May 23 or the UK would have to take part in elections to the European Parliament beginning that day. Mrs May told Mr Tusk in the letter she did not believe it was in either the UK's or the EU's interests for Britain to take part in European Parliament elections in May. In the Commons, she told MPs: "The idea that three years after voting to leave the EU, the people of this country should be asked to elect a new set of MEPs is, I believe, unacceptable. "It would be a failure to deliver on the referendum decision this House said it would deliver. "I have therefore this morning written to President Tusk... informing him that the UK seeks an extension to the Article 50 period until June 30." And Mr Juncker said that there will "probably" have to be another summit next week to finalise the decision if Mrs May is unable to show on Thursday that she has the support of Parliament for her plans. 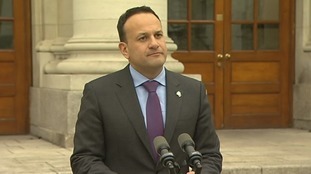 Leo Varadkar said it was time to cut the British government 'some slack'. France said they could veto a Brexit extension unless the UK met three conditions. Foreign minister, Jean-Yves Le Drian, said Mrs May must convince leaders that "the purpose of the delay is to finalise the ratification of the deal already negotiated" and that the deal agreed last November "won't be renegotiated." He also said that the short delay request has to be conditioned on the UK not participating in the European parliamentary elections from May 23-26. Earlier, shadow chancellor John McDonnell told ITV News he believed three-months to a "practical period" in which to negotiate a new Labour style deal with the EU, but the party would ask Brussels to help determine a timescale on talks. Irish premier Leo Varadkar said it was it is "time to cut the UK Government some slack." He said the Irish Govenment were willing to support the UK's request for an extension and the ratification of the Strasbourg Agreement by the European Council over the next two days. But he ruled out any change to the Withdrawal Agreement or the backstop.